By the time I get to dessert at Thanksgiving I’m always stuffed. I want to try everything but it seems impossible since there isn’t any room in my tummy. This year I got smart and made everything as miniature bite-size desserts. Each of these deserts uses the same mini muffin tin for a consistent size. 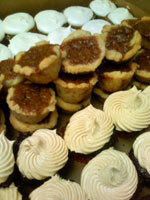 We had a sea of mini pastries, simply delicious. Boil the beer and molasses in a large pot. Then remove it from the heat and add in the baking soda. Whip the mixture and let it sit to cool to room temperature. Preheat the oven to 350 degrees. Mix together the eggs, sugar and oil. Then add the flour, baking powder and the rest of the spices. Pour in the beer mixture and mix to combine. Fill cupcake liners to half way and bake in the middle of the oven for 30 minutes. Cool the cupcakes on racks. 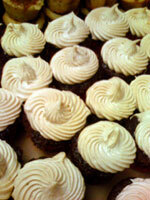 Make these cupcakes one day in advance and let them sit overnight at room temperature before frosting. The cake gets better after a day. Heat the cup of sugar on medium high heat in a heavy bottom pan. When the edge starts to turn brown and bubble, swirl the pan and keep heating to make an even caramel. The sugar will met totally and caramelize, take the sugar off of the heat and swirl the pan to make sure that all crystals dissolve and that the sugar doesn’t get too dark or burn. Pour the cup of cream into the sugar and let it continue to cook. After 10 minutes, stir to pull the sugar off of the bottom of the pan and continue to cook so that the mixture thickens. Take it off the heat and set it aside to cool. Beat the butter and margarine together on high, till fluffy, with an electric mixer, set aside. In a heat proof metal bowl, over simmering water, like a double boiler, wisk the egg whites and remaining sugar. The sugar crystals will dissolve and the mixture will get thick and turn white. Be careful not to cook the eggs. Wisk the vanilla into the egg whites using an electric mixer. The egg whites will thicken and form soft peaks. Add the egg whites and the caramel to the butter mixture. Beat on high until well combined and fluffy. 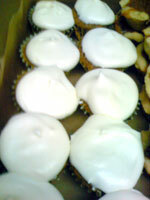 Using a star tip and a zip lock bag, pipe the icing onto the top of the cupcakes. Refrigerate until ready to serve. Preheat the oven to 350 degrees. Beat the eggs in a large metal bowl. Add the sugar, oil and vanilla. Fold in the carrots. Add the rest of the dry ingredients and whisk to form a smooth batter. Fill cupcake liners to half way and bake in the middle of the oven for 30 minutes. Cool the cupcakes on racks to room temperature before frosting. Beat the cream cheese and butter on high in an electric mixer until fluffy and combined. Slowly add the powdered sugar, stirring on low speed after each addition. Add the vanilla extract and beat it on high again for about 3 minutes till fluffy. Using a plain tip and a zip lock bag, ice the cupcakes. Store the finished cakes in the refrigerator before serving. Pre-heat the oven to 350 degrees. In a large metal bowl, mix all ingredients, except the water with a fork or pastry cutter. The goal is to incorporate the butter until it is the texture of course meal. Slowly sprinkle in the water and quickly mix. Making sure not to put in too much water, briefly kneed the pastry so that it forms a cohesive ball. Pull out about 1 tablespoon of dough and flatten into a round, place it into a mini-muffin pan to form a miniature pie shell. Fill your pans and cook in the oven for 20 minutes or until golden brown. Remove to a wire rack and cool to room temperature. In a medium heavy pot, mix the wine and sugar and a little water to dissolve. Add the spices and pear. Add enough water to cover the pear, place a small plate over the pear to keep it submerged. Cook the mixture on medium heat for 30 minutes to cook the pear until tender. Cool to room temperature. Drain the pear on a paper towel. Cut the pear and ginger into small chunks. Place a small metal bowl over a small pan of water on medium heat. Heat the chocolate and cream until the chocolate melts. Remove the chocolate from the heat. Whisk, starting in the center of the bowl till it forms a silky ganache. 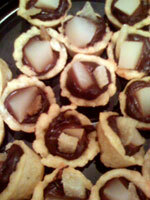 Fill the tart shells with a spoon full of the chocolate ganache. Place one chunk of pear and ginger in each tart. Serve at room temperature. Pre-heat the oven to 350 degrees. Mix all of the ingredients in a stand mixer until light and fluffy. 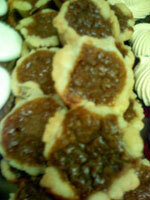 Fill the mini pie shells 2/3 of the way full and bake in the oven for 30 minutes, until golden brown. Cool on a wire rack and serve at room temperature. Pre-heat the over to 350 degrees. Add all of the ingredients, except the pecans to bowl and beat with a whisk until combined. 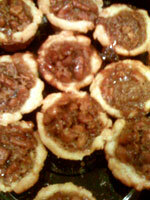 Fill the tart shells with the chopped pecans. Cover with a spoonful of the sugar minter. Bake for 30 minutes until the pies are golden brown and crisp. Cool on a wire rack and serve at room temperature.